Students are invited to apply to be mathematical researchers in MEGL starting the Spring 2019. 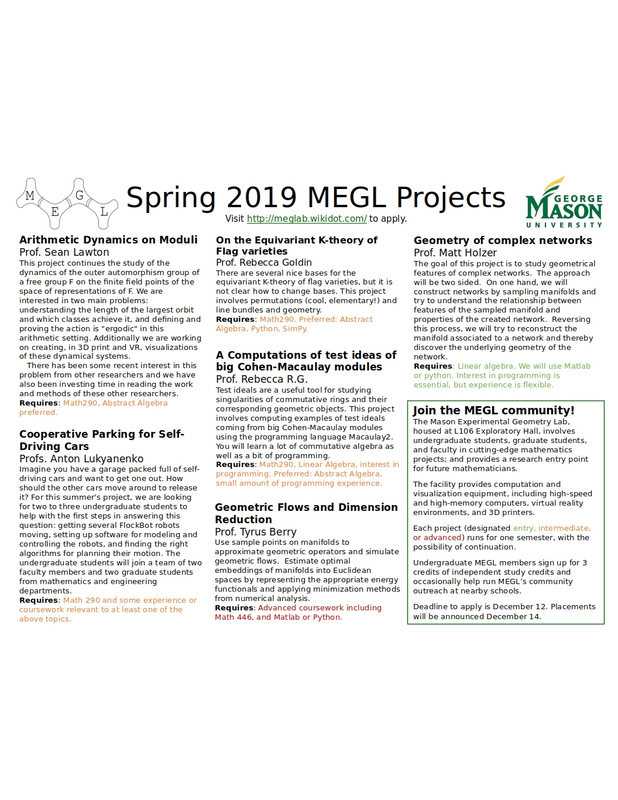 Please see our flyer to learn about the awesome projects we have in lined up for Spring 2019. Applications close on December 12. Teams will be announced on December 14. We encourage all MEGL participants who have completed one term with MEGL and are continuing to a consecutive term on the same project to apply to OSCAR funding for future MEGL research (both summer, fall, and/or spring). We also encourage all MEGL participants to participate in the COS Science Slam after one semester with MEGL, and the Undergraduate Research Colloquium poster contest in the Spring (based on their Fall-Spring results). Spring 2018 MEGL Open Positions (Flier):Visualizing Continued Fractions supervised by Dr. Lukyanenko, Riemann Hilbert Correspondence supervised by Dr. Carchedi, Exploring Geometric Flows supervised by Dr. Berry Arithmetic Dynamics supervised by Dr. Lawton, Equivariant Cohomology of Flag Manifolds supervised by Dr. Goldin,Math Outreach supervised by Dr. Lawton. Erdös-Szekeres Problem supervised by Dr. Soltan, Exploring Geometric Flows supervised by Dr. Berry, Arithmetic Dynamics supervised by Dr. Lawton, Math Outreach supervised by Dr. Lawton. See flyer for application instructions. Geometry Labs United 2017 Conference: See here for details. See flyer for application instructions. Spring 2017 MEGL Open Positions: 1. Research in Algebra and Combinatorics: 1-2 internships; 2. Research in Number Theory and Dynamics: 1-2 internships; 3. Development in Virtual Reality Mathematical Visualization: 1-2 internships. See flyer for application instructions. Fall 2016 MEGL Open Positions: 2 paid internships, and 3 work-study positions are available for Fall 2016. See flyer for application instructions. Application deadline: 8/26/16. Late applications will be considered until positions are filled. Fall 2016 MEGL New Project: 1-3 students are sought for a new project "Mathematical Art and 3D Printing” under the direction of Dr. Sander. See flyer for application instructions. Application deadline: 8/26/16. Late applications will be considered until positions are filled. Summer 2016 MEGL Positions: 3-4 paid internships are available for Summer 2016. See flyer for application instructions. Application deadline: 5/17 2pm. Conference on Geometries, Surfaces and Representations of Fundamental Groups at the University of Maryland, June 22 - June 24, 2016. See here for details. Funding is available for graduate students.